Last Saturday was a great day. James had just purchased his first bottle of Fernet Branca, and the occasion merited a thorough exploration of the ingredient. 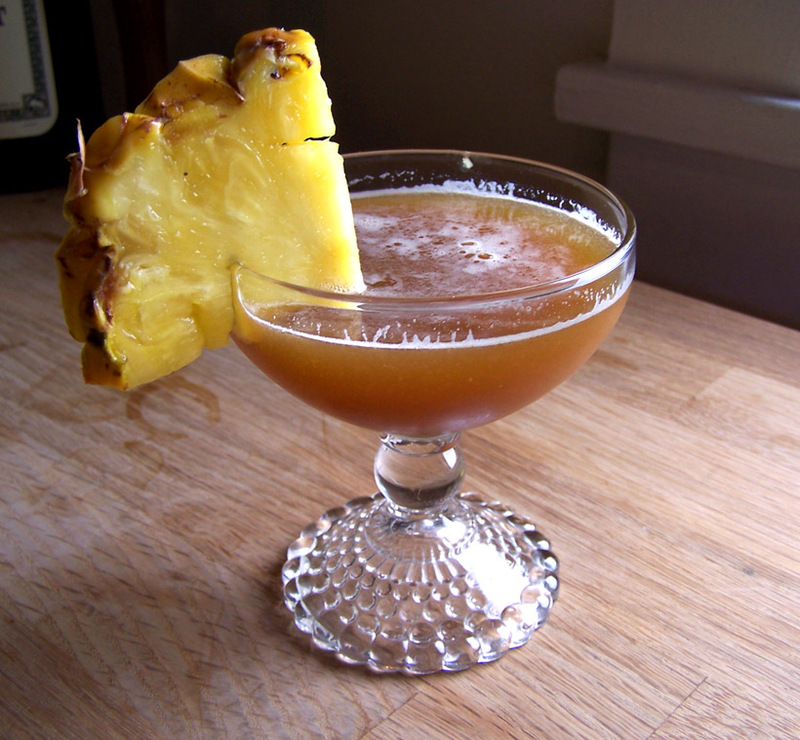 Pineapple juice and Fernet is one of those few truly extraordinary flavor pairings, like chocolate and peanut butter, or foie gras and sauternes, and I wish it were better-known. Moreover, fresh pineapples have a limited window of availability, and I like to get while the gettin’s good, so I juiced a whole pineapple, and separately, a few ginger roots, and took them to the party. For our first drink of the day, I mixed up a Bartender On Acid. I first learned of this drink through CVS, and I fell in love with it because it was a classed up version of a prole drink, like Audrey Hepburn in My Fair Lady. Shake over ice and double strain. Serve “Up”. The Bartender on Acid is a highly improved version of that old college classic, the Surfer On Acid, a trainwreck of a shooter containing equal measures of canned pineapple juice, Jagermeister, and Malibu. Fernet Branca has the same dark, herbal, bitter personality that Jager does, but it has much more subtlety, and much more bitterness. It also has the alluring quality that frat boys don’t really drink it. A traditional rum such as Wray and Nephew or Smith and Cross replaces the Malibu’s artificial coconut flavor with a hefty slug of “hogo“, the sulfurous, grassy, funky quality of rum which is distilled from molasses in a pot still, as in the traditional style. It’s rare to see an equal portions drink achieve such an excellent balance. A+, would drink again. For round two, I was feeling inspired by this post at the Tiki Speakeasy, so I decided to put that pineapple juice to good use with a couple of original creations. Ginger and pineapple is another great pairing, and so is ginger and fernet, so I had it in my mind to combine the three of them into a highball. Combine all except ginger beer in a shaker, shake over ice and double strain over fresh ice. 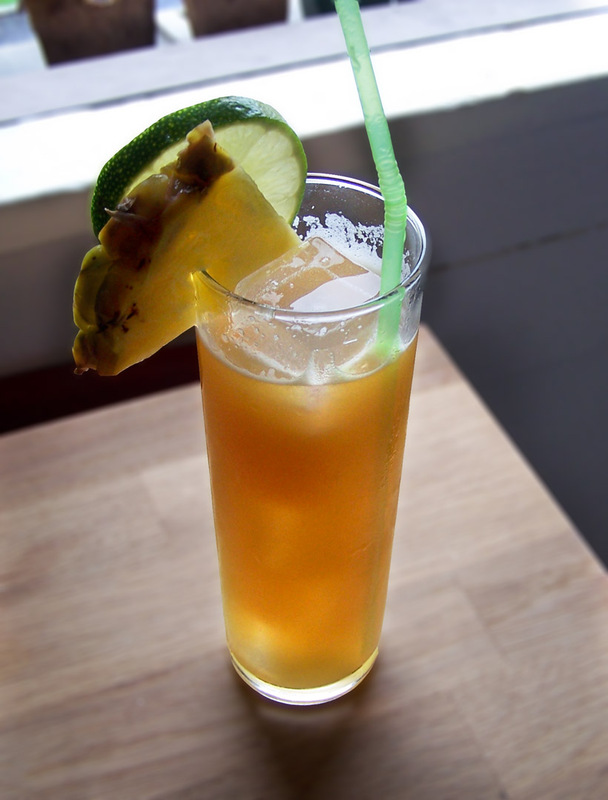 Top with ginger beer and garnish with a pineapple slice and a lime wheel. 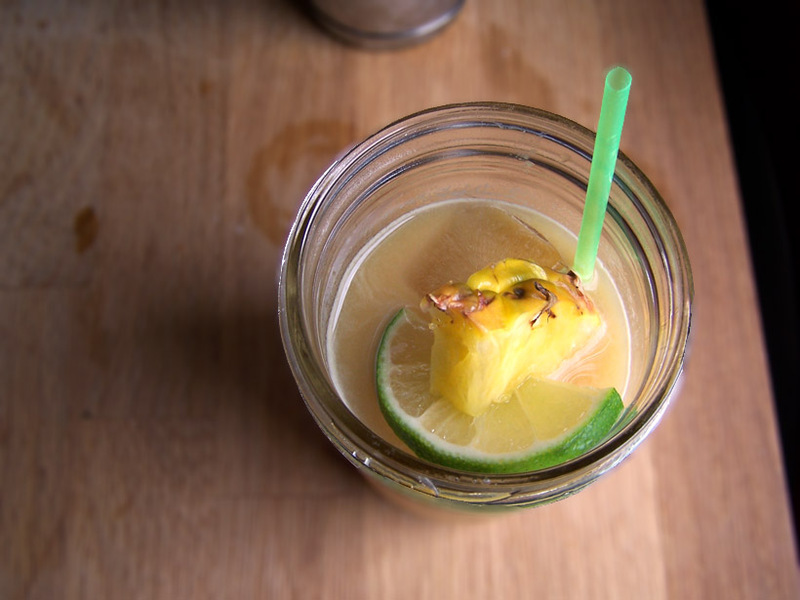 Double-down on your garnishes when you’re making a tiki drink. It has to look exotic, and we accomplish that with more cut fruit. I added a few spoonfuls of fresh ginger juice to this drink to add a ginger spice, and relied on the ginger beer to contribute the necessary sugar. It was very refreshing, but without any simple syrup, the whole drink was very dry, perhaps too dry for some palates. Such a drink is to my taste., but we also had some orgeat hanging around from the Trinidad Sour, and James wanted to see how the orgeat would fit into this drink. Combine all except ginger beer in a shaker, shake over ice and double strain over fresh ice. Top with ginger beer and garnish with a pineapple slice and a lime wheel. Cut the pineapple so that it’s eating the lime wedge, like Pac Man. I tasted this drink with only .5 oz of the orgeat, and it didn’t really have the almond sweetness that I was looking for. The addition of orgeat covered up the fernet, and I didn’t want to add any more lest I upset the balance between the other flavors. The addition of sugar to the drink made it much more approachable, and I think that a mint leaf might help bring the fernet back into focus. This variation will probably suit most peoples’ tastes more than the Piña Branca, and I’m fine with that, as long as it keeps them off of the Malibu. Categories: original creations, tiki | Tags: booze, british navy rum, cocktails, drinks, fernet, fernet branca, ginger, ginger beer, ginger juice, lime, mixed drinks, orgeat, orgeat syrup, pineapple, pusser's, rum, summer drinks, tiki, traditional rum, wray and nephew | Permalink. Nice post. All look good but we will be trying the Bartender on Acid today…curious how frenet and pineapple play together.. I recently acquired a scrappy’s bitters sampler set (http://www.whisknyc.com/scrappys-bitters-pack) and am dying to use it, particularly the cardamom one. Got any suggestions? If you really want to highlight the flavor of the cardamom, the easiest, though perhaps slightly boring thing to do, is to make a martini in a 2:1 ratio of gin:dry vermouth and top it off with a few dashes of the cardamom bitters. Maybe add 1/4 oz of simple syrup to draw out the flavor of the spice. A more interesting idea, though one that will require experimentation and careful tasting, would be to mix it with fresh carrot juice, ginger syrup, and dark rum. Fernet is a tricky one for me; I’ve never known quite how to use it to its advantage (and find that the half-Fernet, half-Coca Cola mixture that the Brazilians seem to love upsets my stomach a little). I’m excited to try both the Bartender on Acid and the Piña Branca soon! Great work, you know honestly I thought I was the only one to realize how amazing this pairing was. The combo of Fernet, Ginger, and rum was actually something I’ve been playing with.